A Mountain Home man has been arrested in connection with a theft of items from a residence in Gamaliel after he allegedly bought the stolen items but refused to tell law enforcement who he purchased them from. 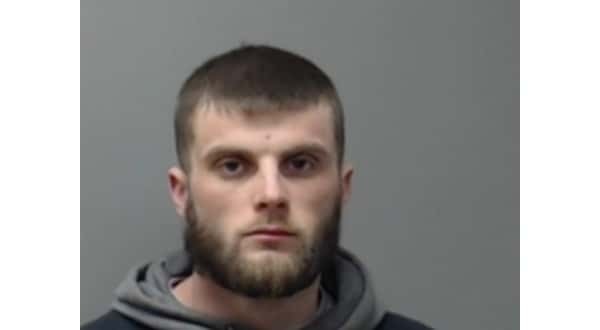 Twenty-four-year-old Bryan Ashley Calvert was arrested Friday evening in connection with the incident, which happened over two months ago. According to the probable cause affidavit, Calvert was stopped by a Baxter County deputy and an Arkansas State Police trooper on Highway 101 in Gamaliel Jan. 6th. The deputy noticed a brand new, still in the crate, air compressor on the trailer being pulled by Calvert. Calvert told the deputy he had gotten the air compressor from a family friend, after it had been left to him in a will. Calvert agreed to take the officers to the friend's house where the female denied giving the item to Calvert. While at the house, Calvert allegedly told the deputy he had been lying to him about how he got the air compressor. Calvert said he had been in the company of "a couple of felons" earlier in the day, and he bought the items in the trailer from them for $500. Calvert, a convicted felon himself, said he told the officer he had lied because he did not want to tell on the other felons. On Feb. 1st, the sheriff's office received a report from a Gamaliel man who said someone had broken into his house and shop. Among the items missing was an air compressor matching the description of the one found in Calvert's possession. The victim was shown a picture of the item and identified it as his. Calvert is charged with two felony counts of breaking or entering, along with misdemeanor counts of theft of property, obstructing governmental operations and a probation violation. His bond is set at $7,500.